Paranormal? Earling Possession – Anna Ecklund – Last Sanctioned Exorcism – Begone Satan. This is possibly one of the most publicized possessions during the twentieth century. It was written about in Begone Satan by German author Reverend Carl Vogl There is a plethora of information one can find on the Internet about this event. Rosemary Ellen Guiley wrote about the case in the book, “The Encyclopedia of Demons & Demonology.” She states the Earling Possession occurred in 1928 with the possession of Anna Ecklund that multiple entities were within one victim. The exorcisms in Earling, Iowa totaled 23 days and included three sessions. It’s a fascinating account of an event that is not a fairytale and one that would be good to cover for new paranormal investigators. While it’s extremely rare, this does occur and is serious and should not be taken lightly. Ecklund was born in the Midwest section of the U.S. in 1882. She was raised as a Catholic and was devout in her faith. According to Guiley’s book, Ecklund started showing symptoms of possession such as a revulsion to to holy objects, the inability to enter church and disturbing thoughts about sexual acts and becoming totally possessed by at 14 years of age in 1908. She traveled and went to visit her Aunt Mina, who was a reputed witch, according to Reverend Carl Vogl and mentioned in his book, “BeGone Satan!” The books states her aunt caused her possession by placing spells on herbs used in her food. The book states that Father Theophilus Riesinger, a Capuchin monk from St Anthony in Marathon Wisconsin completed a successful exorcism on Ecklund in 1912 but she became possessed again after her father heaped curses on her, wishing her to be possessed. Father Theophilus Riesinger once again tried to exorcize Ecklund in 1928. We wish to endorse your pamphlet “Vade Satana”; as a potent aid to faith in the value of sacramentals, relics of the saints, and prayer. No more vivid picture has been presented to us of the losing battle against the “camp of Christ.” Nothing has made our insistent floundering from the “camp of Christ” to the “camp of the devil” appear so absurd. 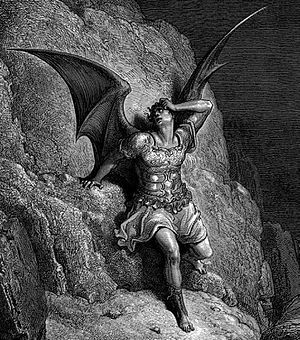 The memory it has instilled of the hatred of Satan and the eternal misery of his permanent army, evokes a continuous inventory of one’s life, savoring of the minuteness of the final judgment. That it will save many souls we have no doubt. That some will borrow fruitless fright is also possible, but for them one must say that if the picture is terrible the real thing must be worse. Agony is the lot of all at least once. Father Gary Thomas from California, who the movie, “The Rite” was about speaks to a local news station about real life exorcisms. This can give you some current information about priests of today and that they do perform exorcisms on real people. Guiley continues in her book that “The ancient ritual began in earnest the next morning. Father Theophilus had several of the strongest nuns hold Anna on a mattress laid upon an iron bed, and her clothes were bound tightly around her to prevent her from stripping herself. With Father Theophilus’ first exhortations Anna’s mouth clamped shut and she fell unconscious, followed almost immediately by an extraordinary fear of levitation. Rising swiftly from the bed, she hung onto the wall above the door like a cat, and it took great effort to pull her down.” Father Theophilus had hoped to keep the exorcism a secret but the noises coming from a convent of Franciscan sisters in Earling told a tale that brought out many citizens. Father Steiger had agreed to help by opening his parish for the exorcism. During the exorcisms, Ecklund vomited and spit, her face distorted and head swelled, eyes bulged and her stomach grew so large and she became so heavy that the iron bed nearly broke. During this time she only swallowed small amounts of water and milk, eating no food. She was near death at times. She understood language she did not know, reacted to holy objects and was able to expose secret sins of those present. Father Steiger was harassed for allowing this to happen in his parish and was later involved in an auto accident that the devils predicted during the exorcism. Ecklund was possessed by many other lesser devils and spirits. However, her principal tormentors were Beelzebub, according to Guiley’s book. Beelzebub eventually acknowledged that the curses of Ecklund’s father, Jacob, began her possession when she was 14 years old. While many things occurred during the long days and nights of the exorcisms, Father Theophilus prevailed and then on the morning of Dec. 23, 1928 the possession was over and Ecklund was no longer possessed. Other accounts report the individual’s name as being Emma Schmidt. According to some of these reports there is an acknowledgement of the exorcism in Earling Iowa found in Papal records and that it did occur at the location reported. “I was a witness to almost the whole period of the exorcism of the Earling possession case and I can truthfully say, that the facts mentioned in Begone Satan are correct. Some of the scenes were even more frightful than described in the booklet. There is not the slightest doubt in my mind, that the devils were present and I will never forget the horrible scenes, vile, filthy, and dirty, as long as I live. All the nuns asked for a change and were transferred the next year. This seemed a fitting article with the recent release of the movie “The Devil Inside.” There is much more that could be written about this even or researched. .
More information about East Texas Paranormal and their affiliations are found on this site. The most recent affiliation is with the Paranormal Clergy Group. « How do we know what is a GHOST? Are they Paranormal? Thanks for sharing such a nice info it is really wrathful stuff….